On a wet September weekend we headed off to Adams Lake for a wonderful few days of fishing and relaxing. 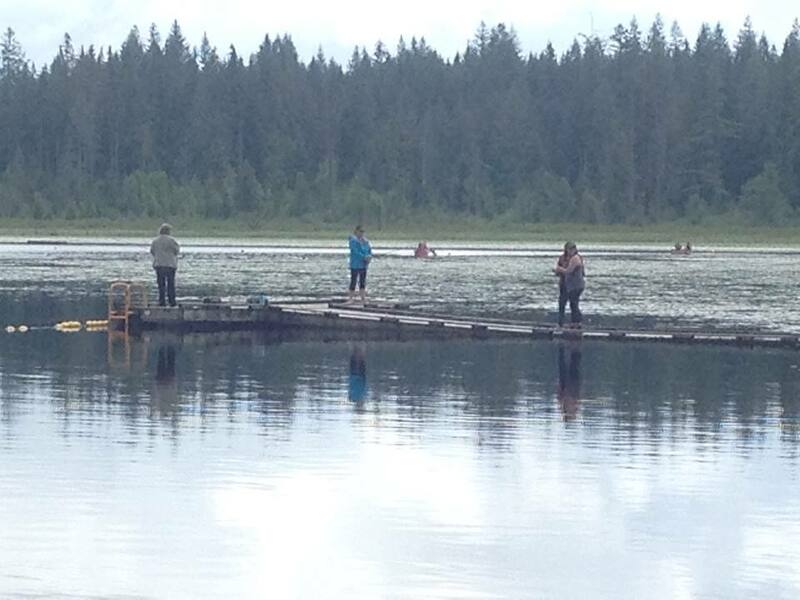 Cheryl, Cindy, Carole, Linda, Lida, and Marj donned rain gear and boots for the pleasure of having a fish tug on the line. Off fishing time was filled with food and stories amid much laughter. Linda with a gorgeous rainbow trout. "It pays to fish in the rain"! Lida, Christine, Jennika, and Cindy made up our group for the Rolley Lake picnic and fishing on a nice day in July. The day before pelted with rain and the meeting was postponed as fishing in the rain is ok but not BBQ'ing. It was one of those gray days where showers come and go but the fish were there and that is all that counts! What better way to celebrate Mother's Day weekend? 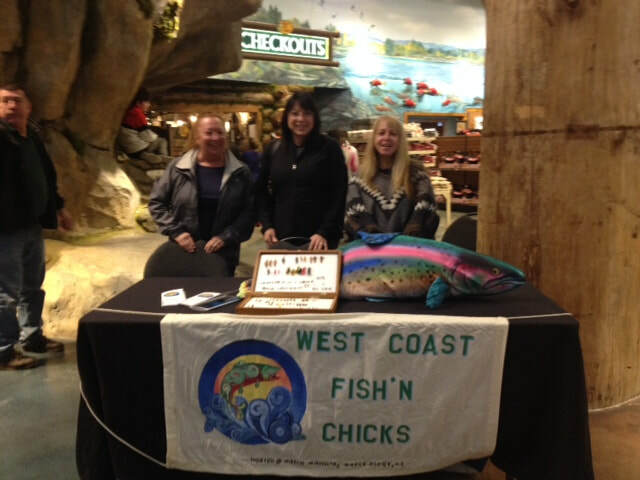 Once again back at Bass Pro where the huge aquarium served as our background we displayed our flies hand tied by each West Coast Fish'n Chick. And guess who showed up! 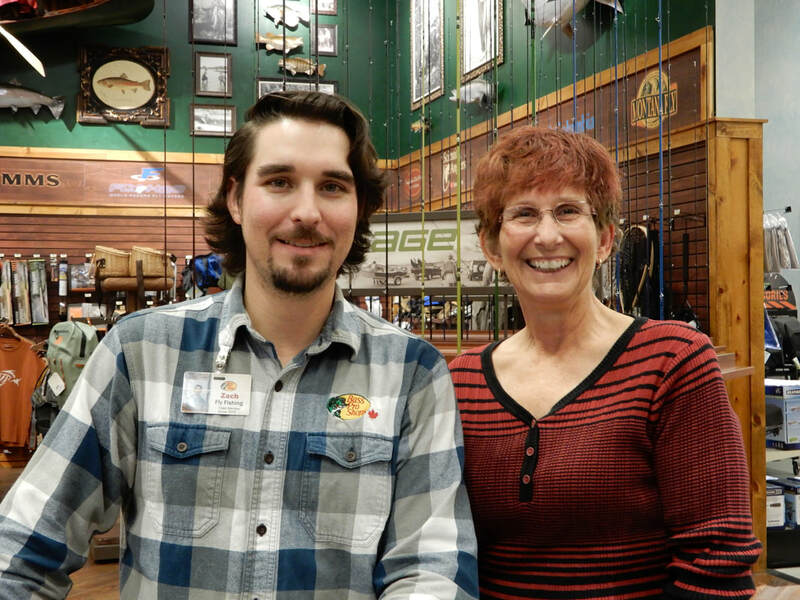 After we packed up the display we headed over to the fly fishing area where Zach patiently taught us a complicated intruder fly called 'Composite Loop Sculpin'. We hummed and we hawed, we groaned and we laughed, but when it was all said and done we all walked away with an excellent fly. Thank you Zach! We learned so much. And thank you Christine for organizing a wonderful day. 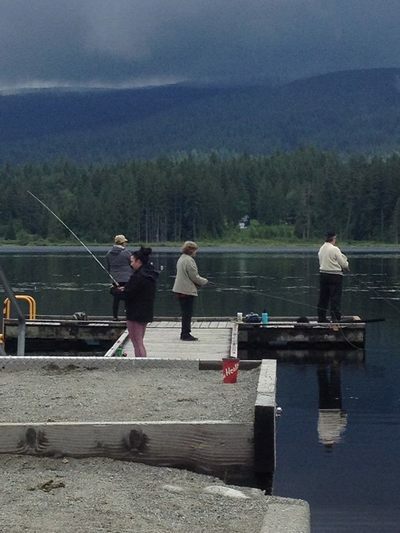 A very relaxing weekend up at Cheryl's cabin at Adams lake where they fished from shore and fished by boat in an attempt to get that big one on the line. Linda this time became our winner in the tournament. For some reason the fish loved her line and that was the one they were going to grab. Congratulations Linda! Though it was cool and sometimes wet everyone enjoyed their weekend. And many thanks to Cheryl who opened up her cabin and hosted the weekend and knew all the good fishing spots. We are looking forward to next year. 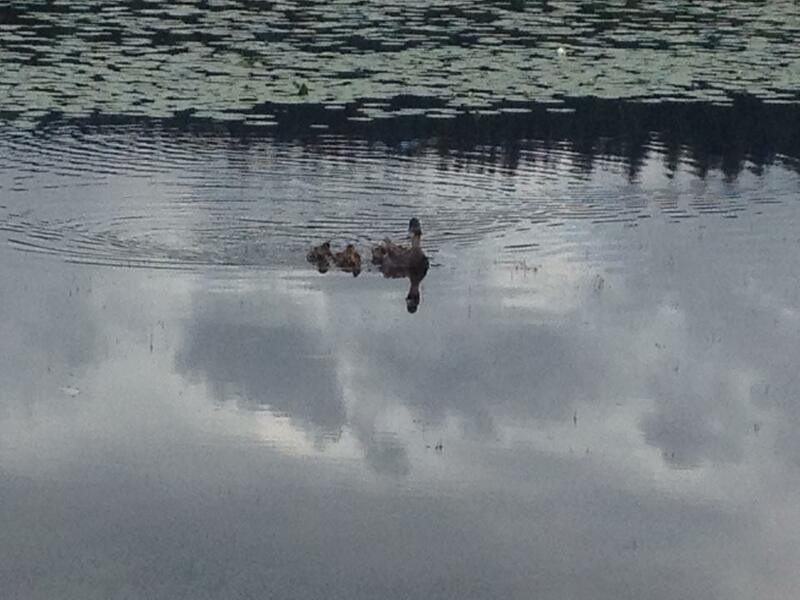 A wonderful day spent fishing with four fish'nchicks and one special guest , plus our helpful hatchery guide. Even as we walked to the ponds edge we could see the fish rolling at the surface. Amidst much laughter fish after fish was caught and released. Dry flies, chironomids, nymphs, mosquito's, leeches, whatever would work. The heat was on to catch as many as possible but at the end of the day it was Cindy who once again won. 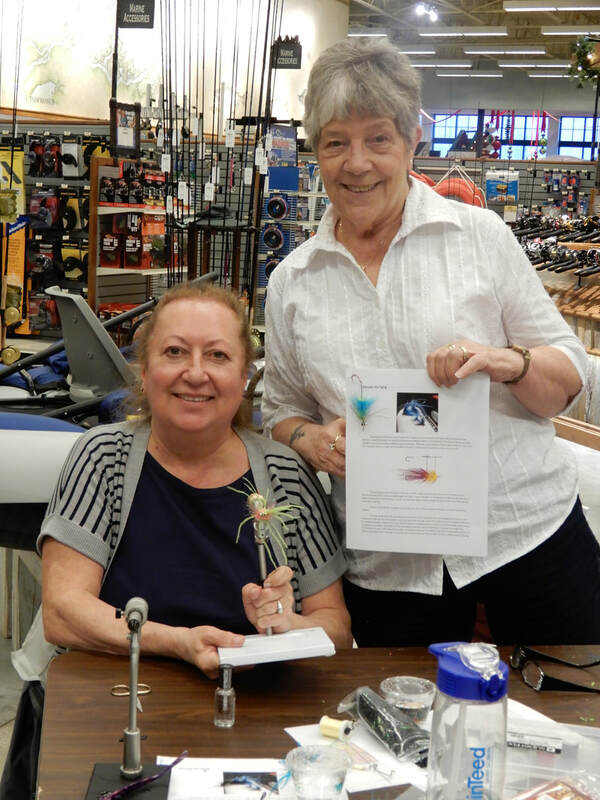 Congratulations Cindy with an awesome 21 fish win! ​ Carole also gave out an official crab measure to everyone as well as a handy key chain that depicts all the characteristics of salmon for easy identification. The time flew by so quickly, as it does when you're having fun, and soon we had to pack up but the thoughts of next year were already in our minds with the feel of tug once again on tournament day! Not only do we love to fish but we also like to help keep the fish habitats clean. 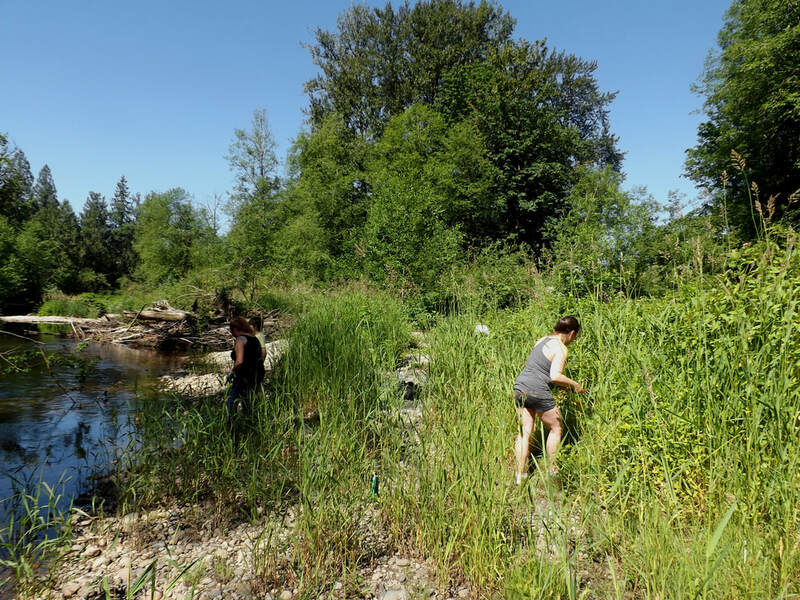 Throughout the year we assist in pulling invasive species from overtaking the rivers and creeks. Volunteering a few hours we pull, dig, and snip plants that would encroach or choke out native plants. 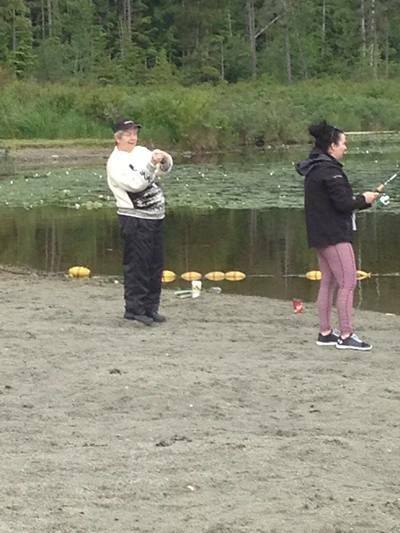 Practicing our casting to warm us up for serious fishing in the coming season at beautiful Mill Lake in the heart of Abbotsford on one of those few sunny days during our wet wet spring. Dreaming of warm days with lines out waiting for that tug. 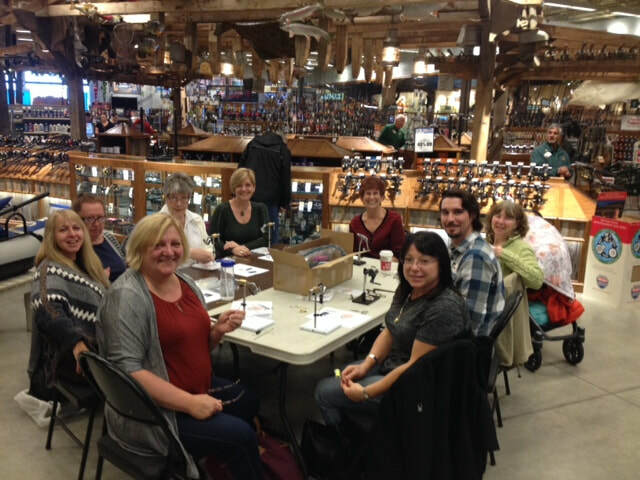 Five ladies - Daniela, Carole, Christine, Patty, and Lida - spent an amazing day in Tsawwassen joining a class at the Bass Pro Shop learning how to tie the Tom Thumb and Humpy. 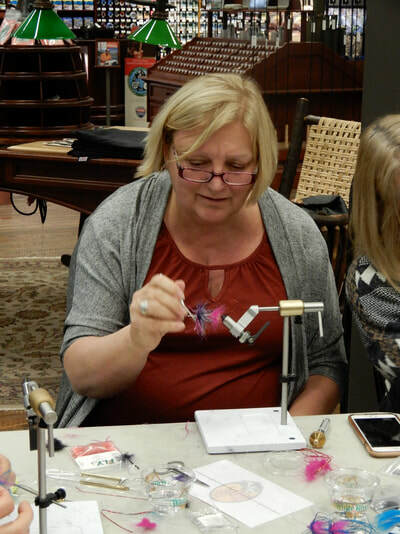 Zach of fridaynightflies.com was an excellent teacher and very knowledgeable, and we all look forward to the next lesson in the fall. The murals in the restaurant were incredible and a must see. Thank you Zach for your kindness and patience and humor! A most interesting field trip in our own home town of Maple Ridge to learn about the construction of these wonderful nets. The care, expertise, and quality have made these nets known not only locally but internationally. Thank you so much Kris and Bob for allowing us to come and see you and and see the heart of your business! Fish clipping at the hatchery. Snip, snip here, snip, snip there - and how may thousand fish later? To catch and keep a coho they have to be clipped so we volunteered to help. And who knows? Maybe one of the fish we clipped will end up on our line! 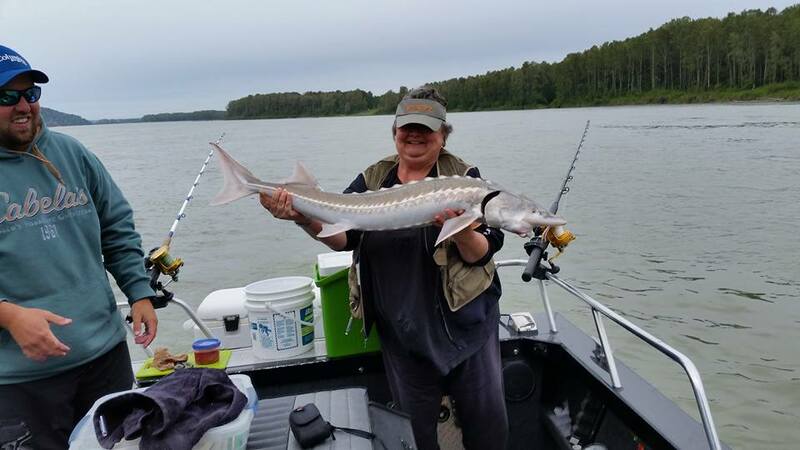 Patty and Rena decided to go Sturgeon Fishing on the mighty Fraser River. To their delight Patty hooked onto a hungry one. 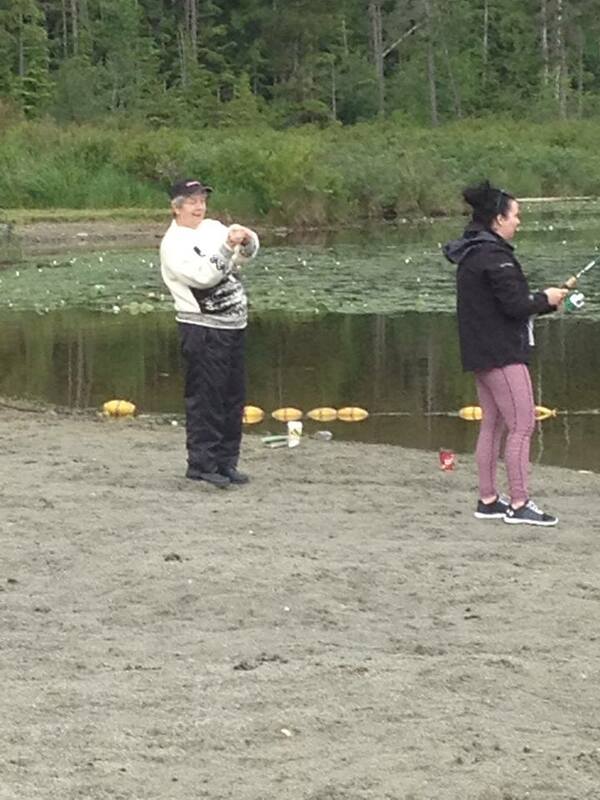 That fish did not want to come but Patty prevailed. Up out of the water came a four foot sturgeon for a quick picture with a beaming Patty and then back into the cool depths swimming free once again. What an amazing day! 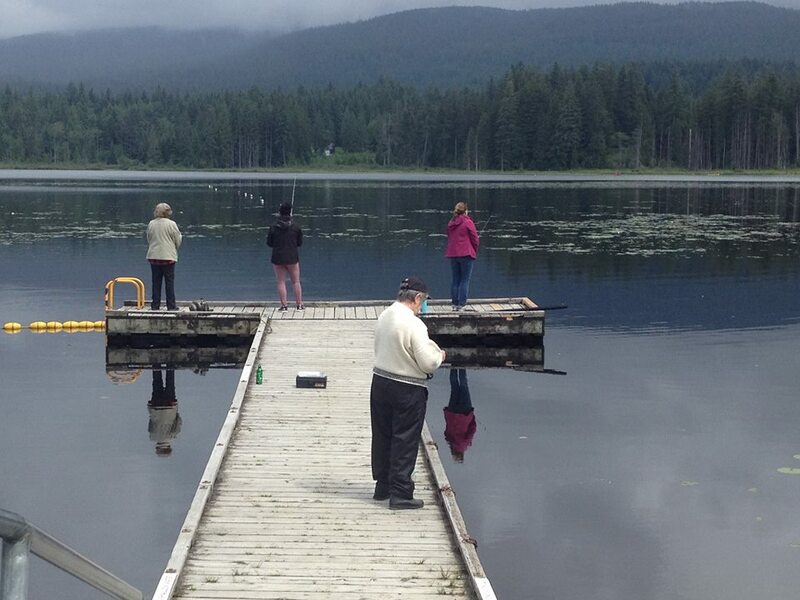 On a beautiful hot sunny Saturday Linda organized a fishing day at Rolley Lake so we could do some local fishing. Linda, Rena, and Cindy paddled a canoe while Cheryl and Marj kayaked. Carole stayed at home base (our picnic table) and set up a wonderful lunch provided by her and Linda. Linda's smoked salmon from a previous fishing trip was delicious. On that breezy day we had the luxury of drifting down the lake and then paddling back up wind and relaxing as we drifted back again. 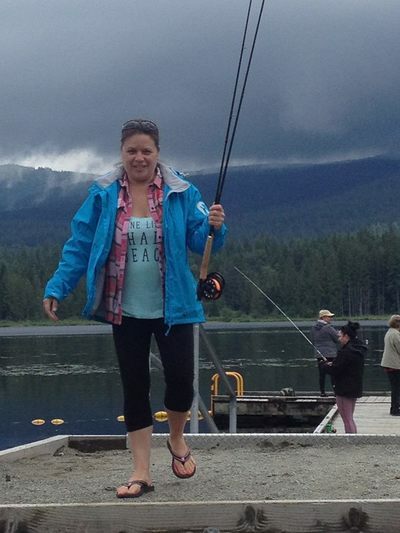 Cheryl made the day by catching a nice looking twelve inch rainbow trout on a half-back fly. The best part was just being out there on the water with lines out and enjoying the company! In Cheryl's words "How could it get any better?" Once again the fish'n chicks met at the Fraser Valley Trout Hatchery ready to try our new flies, some old and true patterns and some of our own design. The pressure was on to catch the most amount of fish in the four hour time slot. Stations were set up around the lakes and everyone rotated around. One lake the sun reflected off the shimmering water and hid the many fish from our sight. The other lake was clear and had us excited as the fish swarmed over to check out our flies. Laughter, talking, and encouragement filled the afternoon as each one of us brought in fish after fish. Tight lines are a delight! Congratulations to Cindy for being our winner this year! 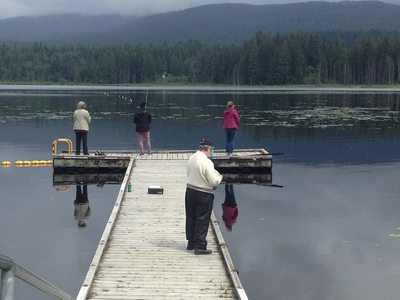 Thanks to Dianne's excellent organizational skills, and knowledge of Salmon Lake, the Fish n Chicks headed to Douglas Lake Ranch to enjoy a couple of days on the water. Arriving Friday evening, we settled in for the weekend noting the rise of the trout and anticipating the sweet tug on our lines. As we sipped our wine and enjoyed Sue's culinary skills, Carole and Marj surprised us all by walking into the cabin with a very choice rainbow. How had Carole managed to be so successful, so quickly? Carole has her secrets, and Marj, the honest narrator could only keep a straight face for so long. Indeed, Carole had caught a lovely rainbow, but released it. As the darkness drew close to the boat, they headed for shore, only to be given another trout by a generous camper. With its very pink flesh, it made a lovely meal and provided much encouragement. The next two days were spent, two to a boat, watching both the water and other anglers. Like so many before us, we discovered the reeds and the stream were choice. Sitting near the deep pool, we varied our casts, lines, and flies. Nymphs, leeches, caddis, and then...ahhh!...chironomids! The kindness of fellow anglers is always appreciated, and those on the lake that weekend were the salt of the earth. A learning curve, our First Annual Salmon Lake Derby was the culmination of the knowledge shared by others. While some of us experienced slow water, it was clear that our president, Cindy was going to come in with the winning catch: two 18" rainbows, each at least 3 lbs. Sunday afternoon, and we turned the boats to shore and home; each fly fisher grateful for the time we spent together, and already dreaming of the next adventure. Hatch Match'r Tackle sponsors a high school tournament. The kids from local Maple Ridge and Pitt Meadows High Schools had a great time in spite of the monsoon-like weather. You'll see that everyone had a great time and a hot lunch was most welcome. And the ladies dressed in the attractive raingear? Well, that's a few members of the West Coast Fish 'n Chicks along to help for the day. to try our own hand at applying our new skills! 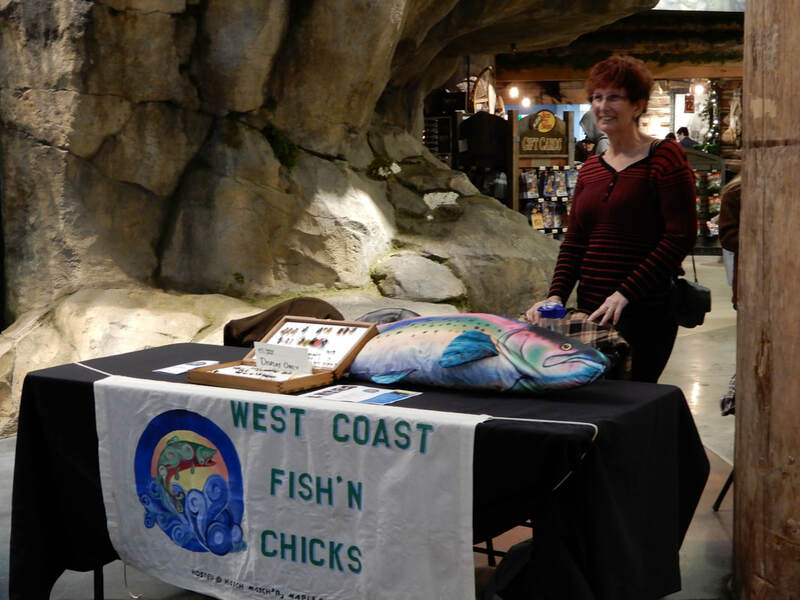 We had a great time and lots of fish kept us busy. Fish `n Chick extraordinaire Barb took first prize for the biggest catch of the day....unfortunately it was her lawn chair. And you won`t get to see Fish `n Chick Dianne`s fashion malfunction! 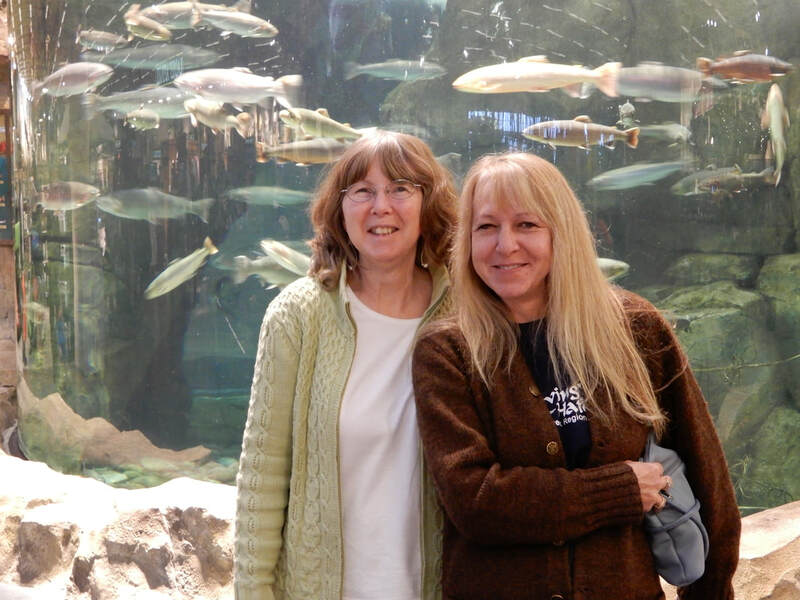 Needless to say, there were lots of laughs and we look forward to going back, especially since 3 Fish `n Chicks are staff at the fish hatchery. The bass weren't co-operating that day but we had lots of casting practice and a great time, thanks to Andy & Jeff from West Coast Bass Anglers! Some of the girls went fishing on the Fraser for sturgeon & pinks but alas, the fish won the day. There were some great prizes though and it was an entertaining way to spend a Labour Day!